The Apal company (Application Polyester Arme Liege) was set-up in 1963 by Edmond Pery to build replicas of famous sports cars. 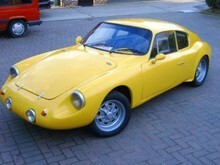 The cars were built on a VW Beetle chassis and looked exactly like the Porsche-Abarth. This was followed by coupes and soft-tops with Renault engines but Porsche and Triumph engines were also fitted. No fewer than 375 cars of Formula V were built between 1954 and 1967. Ten coupes were built in 1968 with a centrally-mounted engine followed by a series of dune buggies. The best known Apal model is the replica Porsche 356 Speedster.